The aim of this study was to propose coaching points for the introduction of wheel gymnastics. Toward this aim, beginners' particularities were investigated, especially those which appeared in side rotation. The examinees were 26 university students (3 males and 23 females) who had no previous experience in wheel gymnastics. Skill observations and questionnaires were conducted to analyze the participants' characteristics. Of the examinees, 54% tended to dorsiflex their necks during side rotation. This kind of feature may lead to a sway of the wheel and prevent smooth rotation. A tendency to dorsiflex ankles was also observed in 85% of the examinees. That means that many examinees could not fix their feet on the foot boards with the bindings. Some of them were unconscious of the positioning of their feet. Of the examinees, 77% examinees could not finish the side rotation, because they could not begin it or because the wheel stopped on the way. 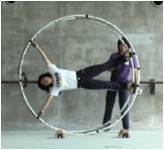 The wheel gymnastics program was thoroughly interesting for all, but at the same time, a fearful experience for about half of the examinees. 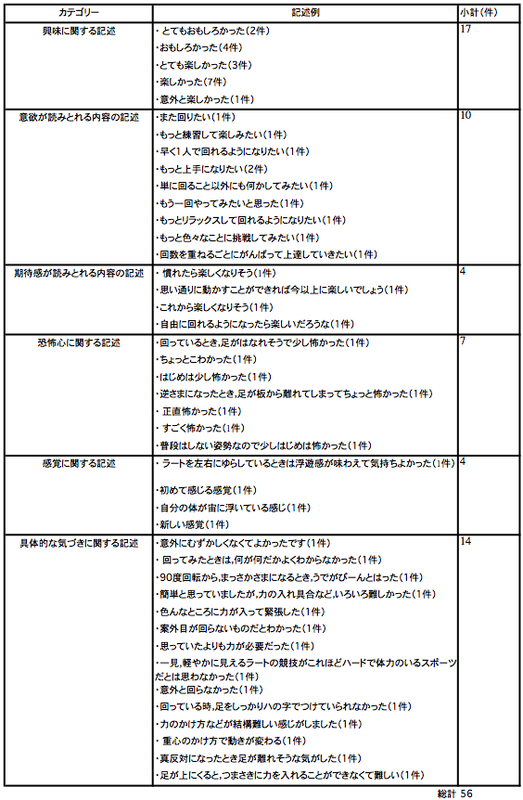 From the results and considerations, the coaching points for introduction of this sport were derived mainly as follows. : 1) Visible target needs to be used to make the face turn toward the front. : 2) Assistant is to be arranged to help the beginner to fix the feet on the boards, to prevent the sway of the wheel, and to push it in case of stopping. :3) Timing of coaching the foot skill for fixing them on the boards needs to be considered. Players' emotional and technical capacity should be taken into account. : 4) Programs should be presented to accustom players to the wheel, and analogical movements should be utilized for emotional apprehension, which will help in developing the correct skills.